We had a record-breaking week in September at the Alberta Aviation Museum with Open Cockpit Day on 23rd and Servus Community Access night on the 28th. More than 1000 people came through our doors during the two events. Open Cockpit Day attracted 700 paying visitors, two-and-a-half times the number we had last year. Servus' free admission night attracted more than 300 people for the free, three-hour event. "We are experiencing an explosion of interest in our museum," says Events Coordinator Zena Conlin. "Edmontonians are finally realizing that we are here to stay and have an amazing story to tell." The number of children in the crowd is also a very encouraging sign, says Conlin. "We feel it's our role to share Alberta's aviation heritage with the next generation. Clearly we are on the right path." Courtney Luke and her husband brought their three small children, the youngest only seven months old to the Servus event. "We came across it online on a Facebook page. 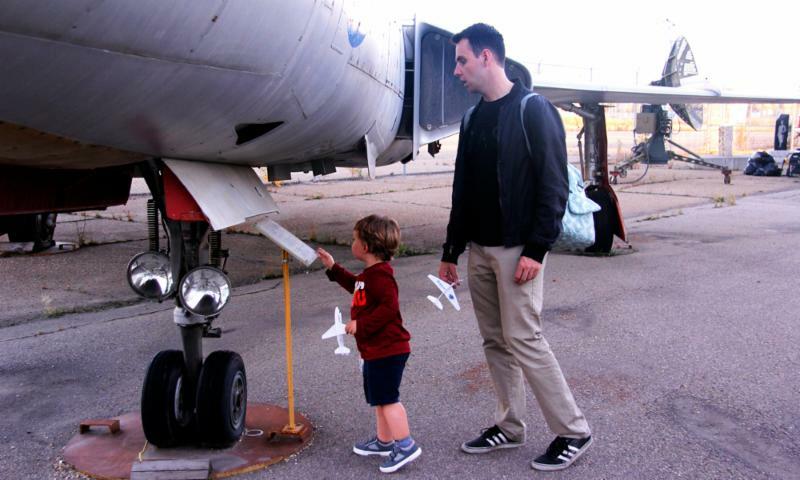 My two year old loves airplanes," Luke says. She appreciates Servus' decision to sponsor the free Community Access Night every month. "With three kids, it's expensive. So we are always looking for cheap or innexpensive things to do and this certainly fits the bill. It's something we will definately try out again." The next Servus Community Access Night will be held October 26 from 5-8pm. Many thanks to Servus for becoming a partner with the museum and to their staff for helping open our facility to a whole new audience. You can find more about Servus Community Partnerships here. More coverage of Open Cockpit Day 2017 can be found here. 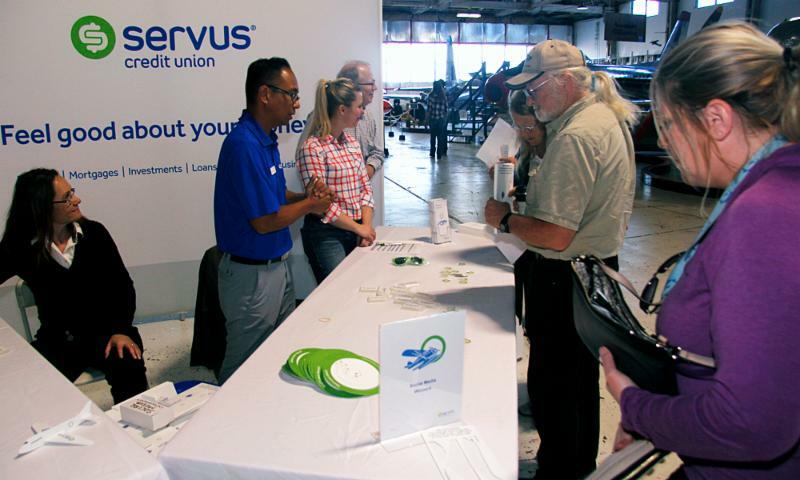 Servus team members were out in force handing out stickers, foam airplanes and other goodies. As usual, our F-86 Sabre was one of the hits of the event, with people lining up to sit in the cockpit. 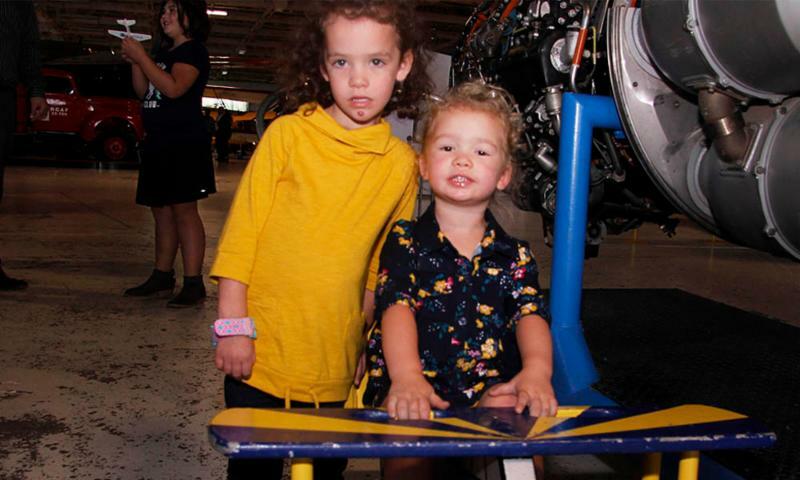 Colbie and Brinlee Luke enjoyed the airplanes big and small. 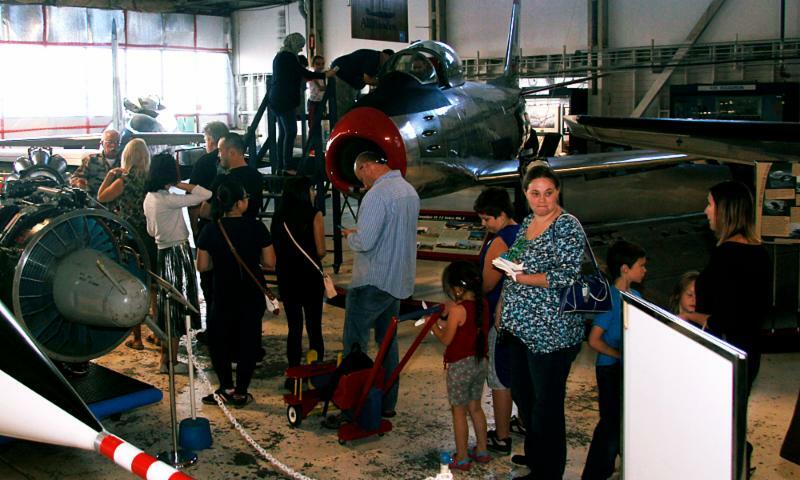 We were delighted to see many young families with children learning about Edmonton's aviation history. The explosion of visitors in recent weeks means we need help around the museum. We are seeking volunteers to assist us bringing Edmonton's aviation heritage to a whole new audience. Help is needed in a wide array of areas. including people with aircraft restoration experience, those with instructional skills for our education program and help to make our special events "special." We also need volunteers to assist with our drop-in program and others to explain the history of our iconic aircraft to those touring the museum. This is your chance to get involved with a great group of people and to be "up close and personal" with the airplanes and stories that made Edmonton a leader in Canadian aviation. We are planning to hold a volunteer information night in the near future to explain more about what we are looking for. So keep an eye on your email for details. You can find more information about our volunteer requirements here. There is also a volunteer application link on the same page. Help us tell Blatchford's amazing history to a new generation. It's your chance to dress up, sip champagne, enjoy a delicious meal and dance to one of Edmonton's top bands, all under the roof Blatchford Field's historic Hangar 14. 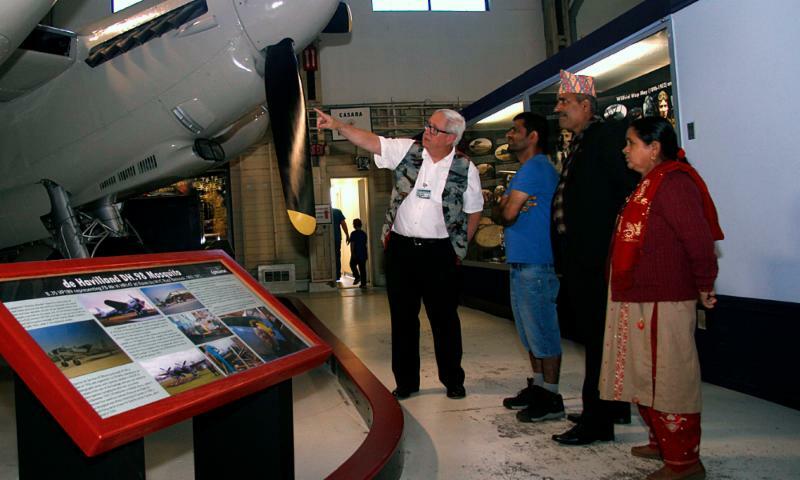 The Alberta Aviation Museum is holding it's first-ever fundraising gala on November 18. Join us at 6pm for a champagne reception and enjoy a walk through the museum to view our revitalization thus far. Continue the fun with an elegant dinner at 7pm prepared by Sorrentino’s Restaurant Group, a silent and live auction. 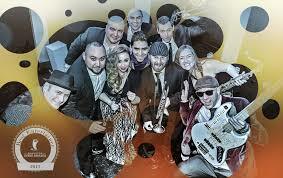 Dance the night away to Edmonton's award winning 11-piece band, The Retrofitz, to complete this magical evening. "This is a opportunity to give Edmontonians and local businesses a chance to help us with our ambitious revitalization plans for the museum," says AAM Executive Director Jean Lauzon. "We have been working hard at the museum to be out in the community and now we are hoping to do the same with our business partners. We have hired a professional event planner to help and we hope this gala will be a memorable experience and an ongoing one." Help us keep Edmonton's aviation heritage alive by buying your tickets today. 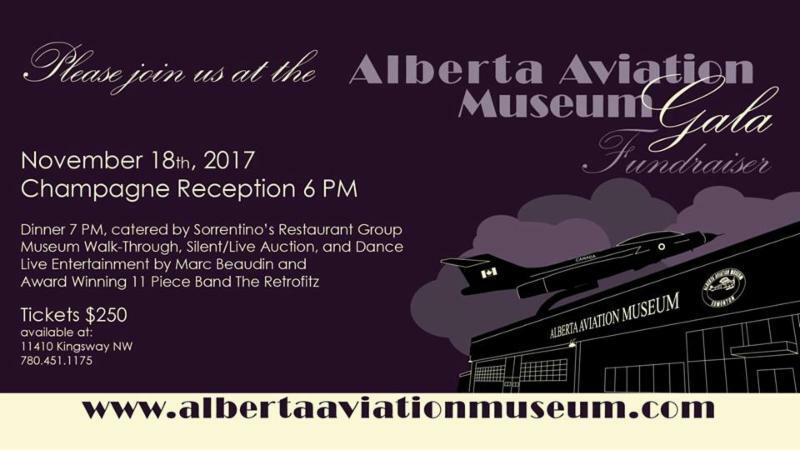 Put on your dancin' shoes and make the Alberta Aviation Museum Innaguaral Gala part of your entertainment calendar. October 26, 5pm to 8pm. Servus Community Access Night. Our first Community Access Night, sponsored by Servus, was a big hit. This free event is your chance bring the whole family to see what the Alberta Aviation Museum has to offer. We'll even have special activities for the kids. October 28, 11am to 3pm. Haunted Halloween at Hangar 14. 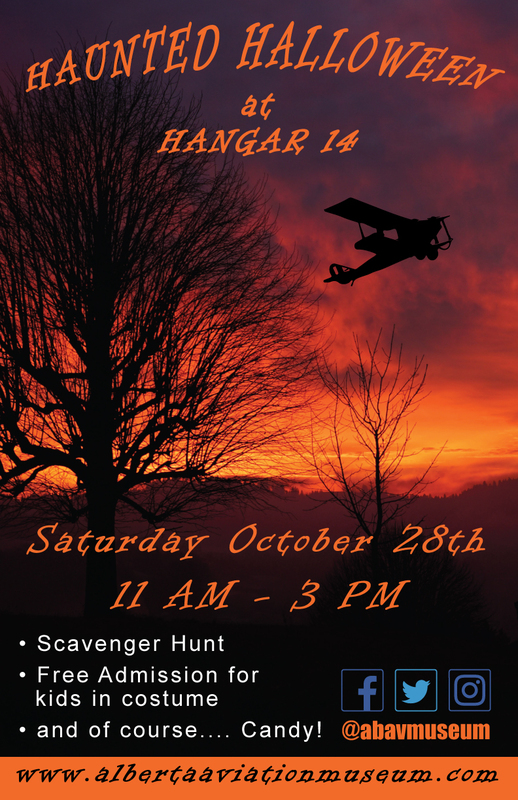 Follow the clues through spooky Hangar 14, complete the scavenger hunt and collect your rewards. Free admission for kids in costume and (of course) candy. November 18. 6pm Reception, 7pm Dinner. Alberta Aviation Museum Fundraising Gala. Enjoy a champagne reception and walk through the museum to view our revitalization thus far. Then join us for an elegant dinner prepared by Sorrentino’s Restaurant Group, a silent and live auction and live entertainment an 11-piece band. Individual tickets are $250 and are eligible for a $50 tax receipt. More information here.